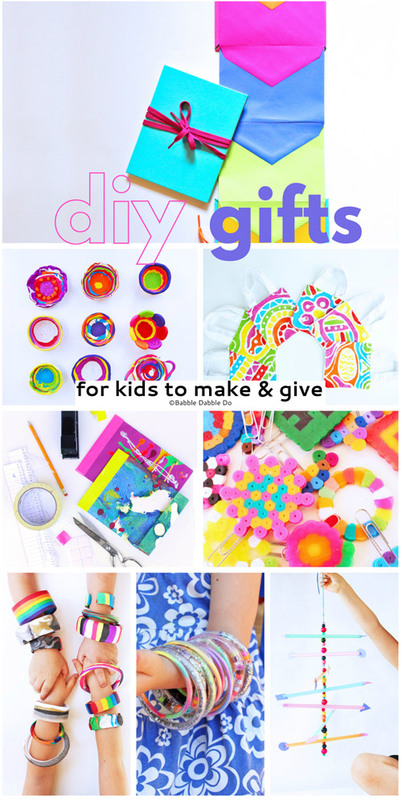 I’m pretty positive that all parents would agree what their favorite gifts are each year…DIY gifts made by their kids! I love the handmade gifts I get from my kids, they are always made with love and children get such joy from seeing their parents’ faces light up opening a handmade gift! 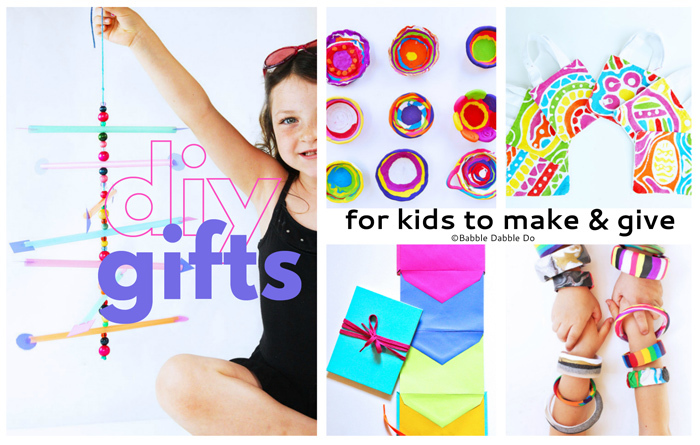 For our final day of Holidays on Babble Dabble Do I’ve collected 12 DIY gift ideas for kids to make for parents, grandparents, friends, teachers, neighbors and more. My daughter is working on a Secret Santa gift for a friend in her girl scout troop and I’m going to share this with her for inspiration! 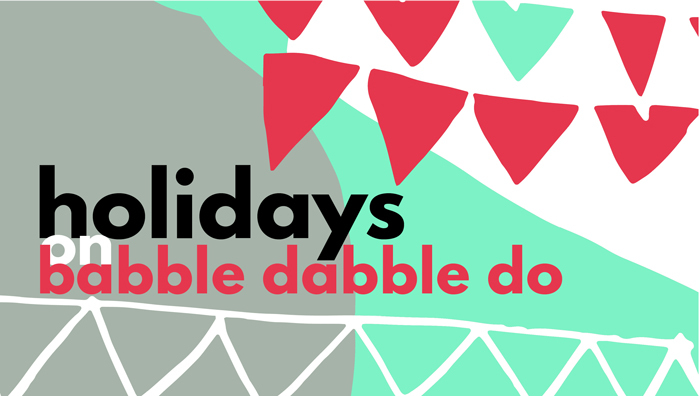 All week I am featuring creative ways to celebrate the holidays with your family! I’ve separated the projects below into 4 categories: pretty containers, jewelry, decorations, and gifts for readers. Clay I’ve included two clay projects made from Polymer clay. If you’ve never worked with polymer clay before here’s why it’s perfect for handmade gifts: it can be baked in your home oven! 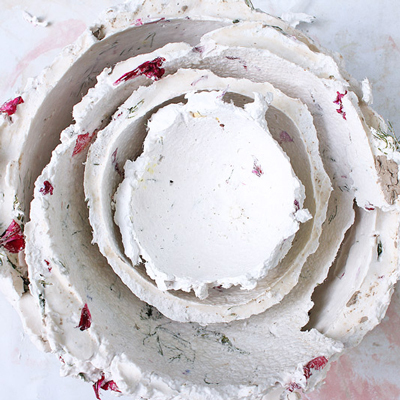 That’s right, you can make clay projects that can be baked right at home. And the clay is so colorful everyone will love to receive and display their clay object d’art! We’ve made Coil Pots with it and beautiful Clay Bracelets. Another unusual idea is to use product called Sculptamold to make ‘Fruit bowls” where the mold is..you guessed it…FRUIT! These dry to be hard and durable. Fabric If you have young sewist at home consider making a Burlap Embroidery gift! Stitch a letter or heart which can be displayed on a wall. Another easy and colorful fabric idea are Fabric Beads. Transform your fabric scraps into lovely beads. Lastly try Glue Batik! Use blank canvas bags and decorate them with this technique. 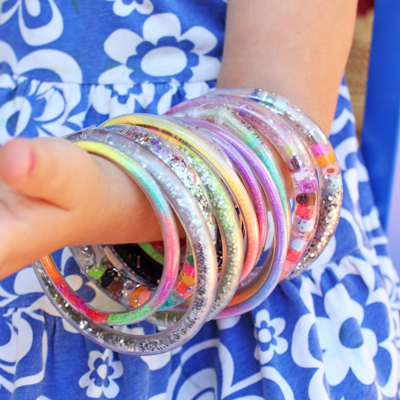 Funky Teen Fun If you have kids making a gift for a teen sibling, you have to check out out Totally Tubular Bracelets and Mini Bookmarks! Mobiles Everyone loves a mobile and I’ve got two ideas for kids to make! Straw Mobiles are really easy for kids to string together. 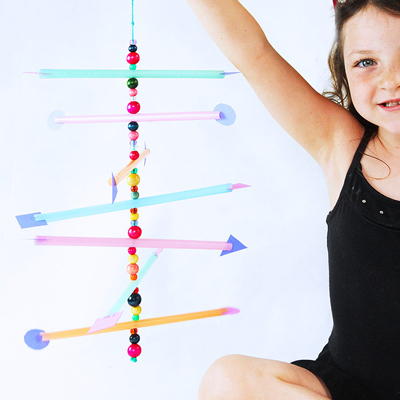 For older kids try Twirling Twigs, they’ll get a physics lesson tucked into their holiday creation! Handmade books Our Accordion Book is sooooo pretty, especially when made with day-glo envelopes! Tuck notes inside each envelope for an additional surprise! For grandparents consider making Recycled Art Journals. 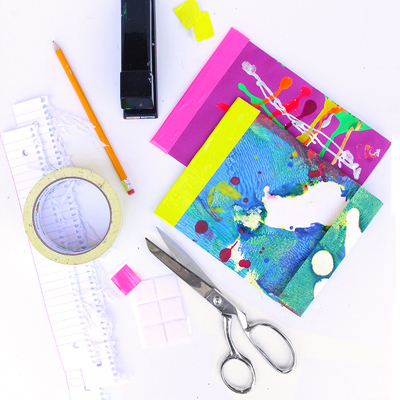 You kids can transform this artwork into an artful handmade book. Learn how to make simple coil pots using polymer clay. 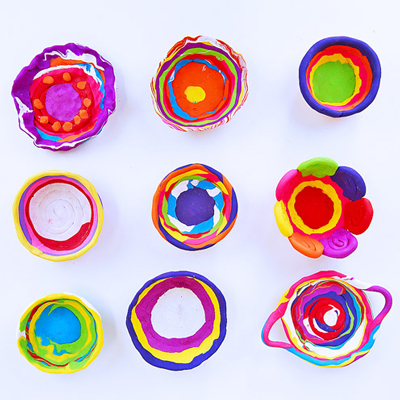 Easy and colorful clay project for kids! 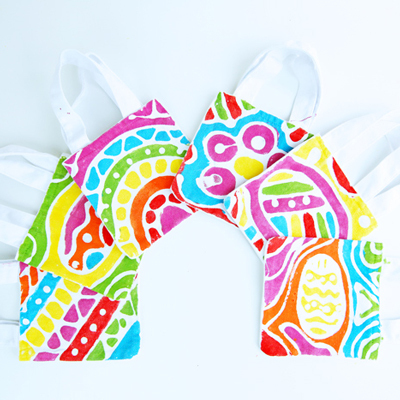 Glue Batik: Learn how to do batik style fabric art with this kid-friendly technique! 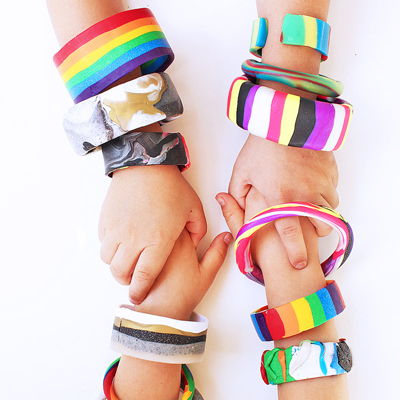 Polymer Clay Tutorial: Learn how to make polymer clay bracelets with these 6 easy methods. 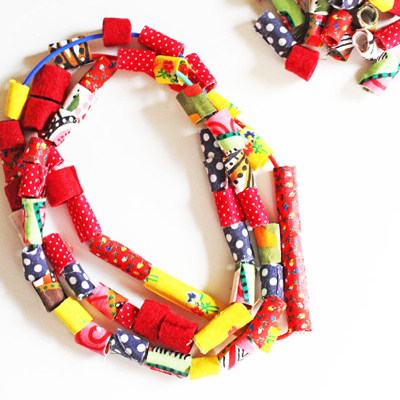 Turn fabric scraps into beautiful beads! Science meets fashion meets the 80s!!! A great demonstration of engineering/physics principles and they look so pretty on display! 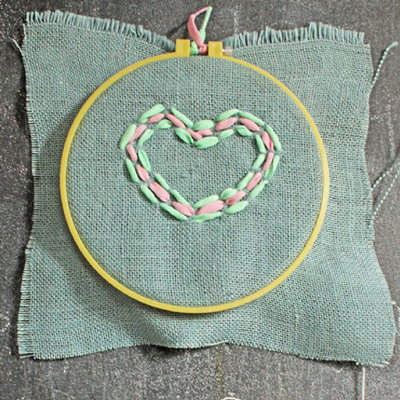 A simple sewing project for kids that can be displayed on a wall! 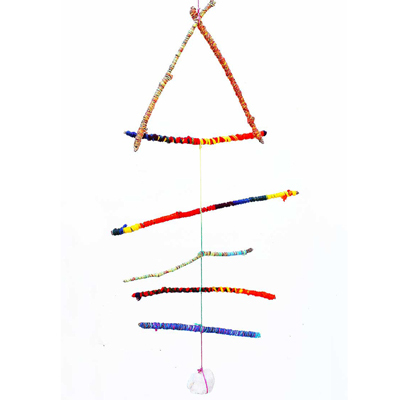 Make a simple straw mobile and explore the concept of the center of gravity. We have had this hanging our house for three years! 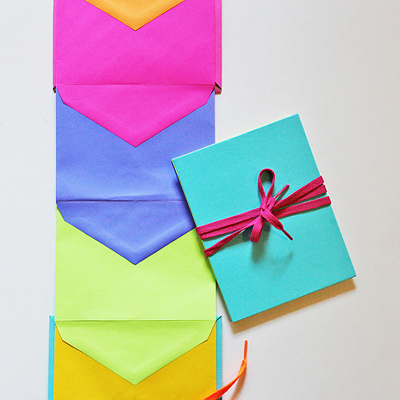 A bright and colorful book made from envelopes! 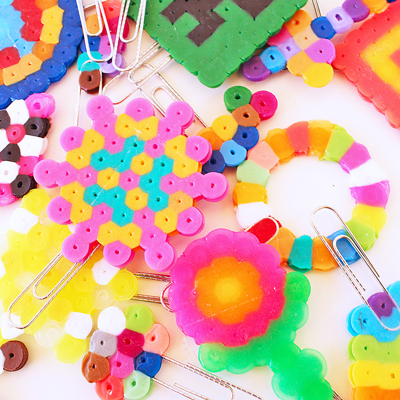 Make mini bookmarks out of Perler beads and paper clips. This is the last post for Holidays Week! I will be collecting everything in one GIANT massive, everything holidays, mega post next week for you to easily pin and bookmark. Until then you can see Monday’s Post with Clever DIY Ornaments to Make with Your Kids here, Tuesday’s post with Colorful Handmade Decorations for Families to Make here, Wedensday’s collection of Holiday & Christmas Kids Activities post here, and yesterday’s Unusual Holiday Card Ideas post here.